Blogger's Note: As I wrote last night, lots of stories coming out of the Wednesday night council meeting. here is another one. As the vote on leasing the borough's mini-golf operation to the Carousel at Pottstown moves closer, the pending deal reveals it will require improvements to be made to the course. Wednesday night, borough officials briefed council members on the negotiations, which will likely be the subject of a vote at Monday night's meeting. 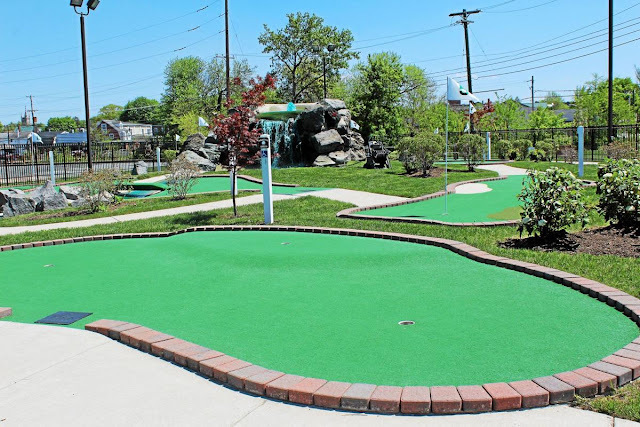 Borough Manager Justin Keller said while it costs the borough about $6,000 a year to operate the Manatawny Green mini-golf course, the Carousel, which is located on the adjacent property, was only offering rent of $3,500 a year. He said while the Carousel representatives are not interested in paying more rent to run the mini-golf course, they are interested in improving it. "We have received comments that the course is kind of sterile," Keller said. So the draft agreement now being recommended by the staff includes a clause that the Carousel will make $12,000 worth of improvements to the course during the three-year term of the lease. Councilman Joe Kirkland wanted to know if there is any possibility of profit- sharing from the deal and Keller noted that first the Carousel will need to make a profit before that question becomes relevant. Given that the borough has experienced an average $30,000 annual operating loss at the site, that is a challenge the Carousel faces. However, noted Borough Solicitor Charles D. Garner Jr., the lease also includes three one-year extensions after the first three years, and perhaps Kirkland's concerns could be addressed during those periods. Parks and Recreation Director Michael Lenhart said the course experienced growth since it opened in 2014, but still lost money. In 2016, it experienced 25 percent growth in revenues, even though it lost $35,000. In 2017, the course enjoyed a 37 percent growth in revenues and losses dropped to $16,000. But in 2018, which "was a fairly terrible year weather-wise," revenues dropped back down by 50 percent and the borough incurred a $25,000 operating loss, Lenhart said. The Carousel at Pottstown opened in 2016 and is a non-profit entity which operates in a building owned by the borough and lease for a minor amount of money. The carousel group has paid for improvements to the building. It now hopes to expand its operations and enjoy some economies of scale by using the same staff to run both Manatawny Green and the carousel operation. Lenhart said although the carousel group and borough have always cooperated, having one entity oversee the whole site will make coordination easier and let the carousel consolidate ticket operations for both facilities. Rides on the carousel are only $2, and it makes most of its money from hosting events, which can now include mini-golf as well. Keller said the lease carves out certain events for the borough to use the course, like when the summer camp children visit.